Jeremy Lusk’s gear, pics, trophy’s and bike will be on exhibit at the San Diego Hall of Champions museum from Wednesday, March 18 - Wednesday, April 15, 2009. The ribbon cutting ceremony will be held on March 18 at 3pm. Please try to make it out there! The San Diego Hall of Champions is the nation’s largest multi-sport museum, representing artifacts and memorabilia’s from more than 42 sports, which tells uplifting stories of nationally known athletes and teams with a San Diego connection. Get more info about all LLF Events on the Events Page. An evening full of fun and excitement , surrounded by the industry’s most extreme athletes in a swanky industrial themed gala and fundraiser. You will enjoy an exquisite 5 star, 3 course California Cuisine along with dancing and live entertainment provided by LA’s top DJ spinning only the best music. Join our star-studded event and participate in our silent auction and poker tournament. Only 80 exclusive seats in Celebrity Poker Tournament. Winner receives Grand Prize. To purchase the VVIP Lounge Package, please contact Leah at 760-535-6085. On April 15th, 2009, the Lusk Legacy Foundation will hold its 1st Annual Gala. We are contacting you to ask for your support by donating items or services to be auctioned at our annual event. The Lusk Legacy Foundation is dedicated to improving the overall safety of riders in the sport of freestyle motocross by protecting the livelihood of the riders and their families at all organized events. The foundation embraces the values of which it was founded upon in recognition of Jeremy Lusk – friendship, camaraderie, passion for each other and the sport of freestyle motocross. We are looking for items to include in our silent auction and raffle drawings. In addition, the Foundation is seeking Business and Corporate Sponsors to support this event. We would appreciate any gift certificates, goods, services or financial support you can provide. Your donation will be tax deductible, and donors will be publicly recognized in our event program and on our website. We do hope you partner with us in our mission by supporting the 1st Annual Lusk Legacy Foundation. Please feel free to contact Marissa Deegan and Leah Steiger at 760.535.6085 or lifeoftheparty74@yahoo.com if you have any questions or need additional information. The Jeremy Lusk “In God’s Hands” tee shirt is available to order now in the Metal Mulisha Online Store for $25! The shirt is based off Jeremy’s tattoos, “In God’s Hands” across the chest, and his famous “LUSK” tat across the back. All proceeds go to the Lusk Legacy Foundation so get it now! The shirts are currently at the printer getting made. We expect them to arrive by this Friday. Shirts will start shipping this Friday 2/27, or Monday 3/2. We appreciate your patience. All proceeds go to the Jeremy Lusk Trust Fund. Monday, February 16th, 2009 at 1:00 PM PST. It is with great sadness that we report Jeremy Lusk succumbed to his injures tonight at 11:03pm PST. 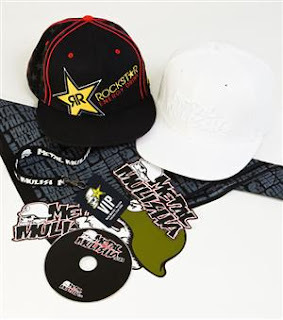 He was surrounded by his loving Mother and father, Chuck & Gina Lusk, his wonderful wife Lauren, his mother and father in law Lyne & Larry along with his closest Mulisha friends Brian Deegan, Ryan Hagy, Cameron Steele & Erik Apple. He is now with our Heavenly Father and is at peace. We know he is performing sick tricks for all those in Heaven to crowds greater than we have ever seen. We will miss you Pitbull! Please keep them in your thoughts and prayers. We will provide further updates on arrangements when we get them. Here is a brief tribute video that a fan put together. Jeremy will be sorely missed. Another way to help Jeremy! The guys at Motoworld have set up another way to help out! $2 wristbands and all proceeds go to Jeremy. -Jeremy remains in a medically induced coma. -He has been stabilized, but remains in very critical condition in the Calderon Intensive Care Unit in San Jose, Costa Rica. -Doctors have been forced to lower Jeremy's core body temperature to continue to treat the swelling on his brain. -He continues to have brain function. -Plans have already been made for Jeremy to be transferred, via private air ambulance, to one of the leading brain trauma centers in the US, pending a scheduled early morning conference with attending physicians, surgeons and family. -Jeremy's parents, Chuck and Gina Lusk left Los Angeles this morning and have just arrived in Costa Rica. Please remember an emergency fund to help defer the costs of Jeremy Lusk's medical care has already been established and is set up to take donations immediately. Through the quick-moving efforts of the Athlete Recovery Fund, those interested in making a donation may do so by visiting www.athleterecoveryfund.com and clicking on the “make a donation” button. All donations made through this website are earmarked directly for Jeremy's care. Have had some requests on where people can send cards and letters. They can be sent to the address below. Thank you all again for your thoughts, prayers and comments. The outpouring of support from people all over the world is truly amazing. We hope to have some updated news soon. Keep the family in your prayers. Some of you may have heard our close friend/ Mulisha team rider Jermey Lusk was critically injured late Friday in Costa Rica during a FMX show. any donation would be greatly appreciated to help the family with all the cost. Please keep him in your prayers and we are all trusting that its in Gods hands now! Below is the link to the site where donations can be made. This should be a great event and anyone in the area should try and attend. Oakley and Monster Energy are throwing a video premier for On The Pipe 5 this wednesday the 11th. it is FREE! it is also going to be a fundraiser for Jeremy to help for the cost to get him back home. I know everyone is hurting from the economy and we are not asking much...if enough people show up and everyone puts in $5...it could add up and go along way. Niki D, Twitch, and I are going for sure and im sure every big name mx rider that is in town will be there to show support for our friend in need. so PLEASE...tell everyone you know...and just make it out to see another sick video for an extremely good cause. It will be held this wednesday the 11th at the Oakley headquarters in L.A. from 7pm untill midnight. Also, don't forget to donate to the Athlete Recovery Fund. Information below. Every $ helps. Big or small. We can all work together to help a fallen friend. Hey everyone. Will probably be a little quiet tonight. Last we heard they plan to start weaning him off meds in the morning. So keep the prayers up. This is a critical time. Jeremy is a Pitbull and a fighter. Everyones prayers, thoughts, encouragements and comments are helping more than you can imagine. Pray for the swelling to go down, doctors who are anointed with knowledge of what to do, strength for the family and no permanent damage to any part of his body. An emergency fund to help defer the costs of Jeremy Lusk's medical care has already been established and is set up to take donations immediately. Through the quick-moving efforts of the Athlete Recovery Fund, those interested in making a donation may do so by visiting http://www.athleterecoveryfund.com and clicking on the “make a donation” button. All donations made through this website, starting TODAY, are earmarked directly for Jeremy Lusk's care! Financial arrangements are being put into place to pay for the Medi-Vac international air transportation that Jeremy will need once he is stable and can be transferred to a leading United States-based Head Trauma Center. It is likely that these funds will be needed within the next few days; therefore immediate donations are certainly appreciated. The Athlete Recovery Fund was established in 2007 and its function is to provide professional athletes in BMX, FMX and Skate Boarding with financial support after severe injury and granting funds for rehabilitation, equipment, long-term disability and educational scholarships. Updates on the condition of Jeremy Lusk who had a major crash at the X-Nights competition in Costa Rica on Feb 7th, 2009. Please leave your thoughts, comments and encouragement for the Lusk family.